Taste test: Nice, and not too strong. Smell test: Good strong aroma, very salty and vinegary. They didn't skimp on the vinegar. Trivia: Small bag was only 29 cents! 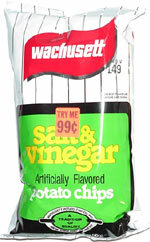 This snack was discovered by Jeremy at Brown's Corner Store, Maynard, Massachusetts.